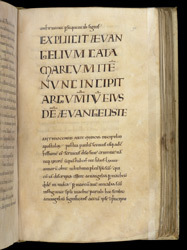 This copy of the Four Gospels belonged to and was probably written for Goda (c.1009-1055), sister of King Edward the Confessor, as is shown by an added ownership inscription of Rochester Cathedral, which states that it had been hers. It was written by two scribes and the decoration was never completed, which may suggest that it was produced in haste. The explicit of Mark, and the heading for Luke, are written in large square capitals, but the opening words of Luke themselves have been omitted; doubtless the intention was to execute them in colours, but this was never done.